Narcissism and Intimacy: Love and Marriage in an Age of Confusion By Marion F. Solomon Published by Norton In our culture we demand a great deal from our intimate relationships--and we are often disappointed. This book not only reveals the social and psychodynamic factors that lead to marital unhappiness, but also offers guidelines for change. Dr. Solomon looks at relationships from many perspectives. She starts by uncovering certain pervasive narcissistic myths and exploring what it means to be intimate in a culture that values autonomy and self-fulfillment above all. Drawing upon both psychodynamic family systems and object relations theories, she shows that experiences in early childhood can lead to narcissistic vulnerability in later relationships. Case examples from her practice clarify how two individuals' feeling states and defenses mesh in the marital system and how the attempt to defend against emotional injury creates barriers to intimacy. The second part of the book focuses on marital treatment. The therapy room becomes a safe haven where both marital partners can experience the therapist's empathic understanding. In this context the fragile self of each partner is enhanced and dangerous emotions are contained and detoxified. As partners learn to listen to one another, rather than jumping in to assign blame, they gradually come to serve important functions for one another. in a particularly interesting chapter Solomon interprets rages, affairs, and addictions as expressions of overwhelming narcissistic vulnerability and offers guidance in managing such threatening acting-out behaviors. The book is sprinkled with case vignettes from the author's practice. Since narcissism exists on a continuum and affects all of us, readers are likely to recognize their patients, their friends--and themselves in these cases. The author, clearly in favor of supporting and treating the marriage when couples seek marital therapy, promotes individual growth and development within the security of an ongoing relationship. Weaving together threads from many sources, she offers a societal critique, a theory, and a method of intervention that will help both therapists and couples deepen the bonds of intimacy. 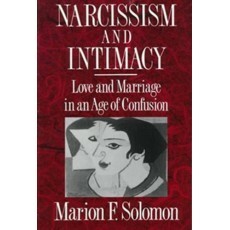 Marion Solomon's wisdom and warm humanity, together with her wide understanding and successful integration of systems ideas with both American mainstream and British object relations psychoanalytic thought and technique, make this book vital reading for all those concerned with the restoration and improvement of couple relationships in this 'age of confusion.' Her elegant style and her ability to present complex issues in simple language without 'writing down' make it a pleasure to read. I recommend it heartily. A uniquely well-articulated and scholarly exploration of the complexities of narcissism. In clarifying the relevance of difficult theoretical concepts to interpersonal relationships, Solomon has written a 'must' book for clinicians who work with couples and families.